THE verdict of the special court hearing the Babri Masjid demolition case has set in motion a chain of events with unpredictable consequences. MS Mayawati's response to the Supreme Court's order in the Taj heritage scam was predictable. Blaming the "Manuwadis" for her woes and projecting herself as a harassed "Dalit ki beti" has become her standard cry. IT is unfortunate that the employees of the Airports Authority of India have taken to the path of agitation. Their protest is misguided and against the national interest. THE question of democracy has come to the political centrestage in Myanmar with force, thanks to the military regime’s high-handed moves. The military rulers attacked the Nobel laureate and democracy leader of the country, Ms Aung San Suu Kyi, on May 30, killed some of her supporters and put her under house arrest, when she was campaigning for her cause near Mandalay in northern Myanmar. ARUNJIT was barely four years old when he suffered a head injury, which put an end to his mental growth. While he grew into his fifties, his mental faculties remained that of a child of four years. Although there was nothing childlike or childish in his behaviour and to a casual observer he appeared almost normal, he needed constant nursing and attention. THE level of politicisation in the institution that traces its roots back to pre-partition Punjab, the one that was spelt with an ‘a’, is so high as to be all-pervasive. The Senate, the Syndicate faculty members, employees and students, all are “politically” active. THE verdict of the special court hearing the Babri Masjid demolition case has set in motion a chain of events with unpredictable consequences. For Mr L.K. Advani's supporters it is a great relief that the Deputy Prime Minister has been discharged in the case. Had the court decided to frame charges against him, he would have been left with no alternative but to resign. Mr Advani had given enough indications that he would not remain in office if the court had found it necessary to proceed against him. However, Human Resource Development Minister Murli Manohar Joshi and seven others are not as fortunate as Mr Advani. They will now have to appear before the court on October 10 when the charges will be framed against them. Given Mr Joshi's statement that he would quit if the court had found him prima facie guilty, it was not surprising that he immediately sent his resignation letter to the Prime Minister who is now in Turkey. His statement was seen by many within and without the BJP as an attempt to make Mr Advani's resignation a fait accompli. At that time, he could not have foreseen that he alone of the two Union Cabinet Ministers would have to put in his papers. Having taken a public stand on quitting the Cabinet, it would be difficult for Mr Joshi to remain in power. As expected, the Prime Minister has rejected Mr Joshi’s resignation. In any case, the BJP has already argued that the case was political in nature and there was, therefore, no need for Mr Joshi to resign. Of course, this provides him some fig leaf to protect his honour should he dilute his insistence on his resignation. It is too well known to recount here that Mr Joshi is close to Mr Vajpayee. In several cases in the past, ministers at the Centre and in states had to resign when they were chargesheeted. This being the case, the BJP's argument that the Babri Masjid demolition case is a different kettle of fish may not wash with discerning observers. Fortunately for the party, the seven others accused of collaboration in the demolition of the disputed structure do not hold any position in the government. Whether Mr Joshi's resignation is accepted or not, the decision of the Rae Bareli court epitomises the best in the rule of law. It is a gentle reminder to the nation that howsoever mighty a person may be, he cannot take the law into his own hands. MS Mayawati's response to the Supreme Court's order in the Taj heritage scam was predictable. Blaming the "Manuwadis" for her woes and projecting herself as a harassed "Dalit ki beti" has become her standard cry. When the lavish scale of her birthday bash in January as Chief Minister of and specious Uttar Pradesh was questioned she used the same language that she employed during a press conference on Friday to explain her position in the great Taj heritage scandal. She is perhaps unaware, deliberately or otherwise that corruption, misuse of power and public accountability are vital issues in India. She also does not know that the country and judiciary are watching the conduct of those who misused power and the trust the public has placed in them. Be that as it may, the nation owes a debt of gratitude to the Supreme Court for acting with alacrity and stopping the vandalisation of one of the world's most precious monument. The CBI too did a splendid job of getting to the bottom of the controversy in spite of the tight time frame given to it for completing investigations. The registration of formal FIRs against Ms Mayawati, a former UP minister Naseemuddin Siddiqui, and several UP and Central civil servants would set the wheels of justice in motion. Ms Mayawati also faces the additional burden of explaining the source of the other assets she may have accumulated during her third stint as Chief Minister. The developments in the Taj scam should revive the debate on how to deal effectively with corruption at high levels in the administration. In the past 10 to 15 years, Indians have experienced loss of national self-esteem because of high-profile scandals, ranging from the infamous field-artillery deal with the Swedish arms company Bofors — for which former Prime Minister Rajiv Gandhi was posthumously indicted — to the case in which another former Prime Minister, P.V. Narasimha Rao, was convicted in 2000. It was known as the JMM bribery case. Currently, former Union Communications Minister Sukh Ram, Mr Laloo Prasad Yadav, his family members and party colleagues are among a number of high -profile politicians being tried in various cases of corruption. But the slow pace of trial has defeated the objective of giving Indian politics a clean image. Both Mr Sukh Ram and Mr Laloo Yadav have increased their political clout after the registration of cases against them. Public opinion is in favour of politicians and bureaucrats being tried by fast-track courts. Only the lawmakers can explain what prevents them from showing respect to the sentiments of the people they represent. In its present form Indian politics has become a moral wasteland, and a career in politics is commonly viewed as a shortcut to wealth and undeserved prosperity. IT is unfortunate that the employees of the Airports Authority of India have taken to the path of agitation. Their protest is misguided and against the national interest. What incensed them is the Central Government's clearance to the proposal to privatise the international airports in New Delhi and Mumbai. While articulating their opposition to the move, one of their leaders is reported to have argued: "A majority of people in the country have not seen an aircraft and the government is talking about world-class aviation hubs. This can lead to social upheaval." What the union has come up with is as archaic and flawed an argument as possible. When computer was first introduced in the banking sector, the employees raised a similar banner of protest only to learn over a period of time that the banks, which have not computerised, have fallen by the wayside. In the case of the airport employees, what is galling is that they are projecting vested interest as public interest. Often, a visitor forms his first opinion about a country by the efficiency of the people manning the airport. One can only imagine what impression a visitor gets when he finds that the escalator at the airport malfunctions, the toilets stink and the employees are indifferent. This is the condition of several so-called international airports in the country which by the employees' own admission rake in huge profits. In other words, the users of these airports — passengers and those sending cargo — pay for services they do not get. Even if the management wants to pull up the erring staff, it cannot touch them because they are unionised and enjoy political patronage. The same recalcitrance is witnessed in Air-India where its proposal to hire employees on a contract basis for its proposed subsidiary has hit the roadblock. Indian airports stand no comparison with airports like Hong Kong, Singapore and Bangkok, to name a few. They also do not have as much volume of traffic as these airports have. The reasons are not far to seek. Our unionised, status-seeking, rights-conscious airport employees will never allow improvement. It is not that privatisation is a panacea for all the ills afflicting airports. The investors will at least strive to improve the services to attract more passengers and cargo. When the government does not have the wherewithal to run airports profitably, it should encourage private initiatives as in the case of the Kochi airport. Disinvestment is the logical step in this direction and any agitation against it is an agitation against progress. THE question of democracy has come to the political centrestage in Myanmar with force, thanks to the military regime’s high-handed moves. The military rulers attacked the Nobel laureate and democracy leader of the country, Ms Aung San Suu Kyi, on May 30, killed some of her supporters and put her under house arrest, when she was campaigning for her cause near Mandalay in northern Myanmar. This ended two years of futile attempts to evolve reconciliation between her and the ruling State Peace and Development Council (SPDC), through the mediation of UN Special Envoy Razali Ismail. The military rulers were obviously compelled to strike as they felt increasingly uncomfortable with the growing crowds at her meetings. The presence of a large number of Buddhist monks at these meetings was a matter of concern to the ruling Generals, as the Buddhist clergy wields considerable political clout in Myanmar. There were clear signs that opposition forces were getting united and mobilised. The internal protests against the junta’s crackdown on the democratic leader have been sporadic and muted, but the international community has taken a strong exception. The US strongly criticised the SPDC, asked for immediate release of Ms Suu Kyi and imposed trade sanctions, banning Myanmar’s exports to the US. Japan, Australia and the European Union have also joined the US in putting pressure on the junta for opening political space and securing Ms Suu Kyi’s release. The military rulers of Myanmar have not bothered much about the Western criticism in the past in view of a sustained support to their position from all their ASEAN colleagues and two of the largest neighbours, India and China. Myanmar’s exports to the US do not account for more than $ 350 million, contributing only a small component to the overall economy of the country, though the stoppage of economic assistance from and engagement with Japan and the EU could hurt Myanmar’s economy in the long run. However, this time the military junta in Yangon was surprised and rattled by ASEAN of which Myanmar is a member. ASEAN avoids taking a public position on issues of domestic politics in the member countries. Ignoring this norm, the ASEAN ministers issued a strongly worded letter on June 17 asking Yangon to initiate a process of reconciliation with the democratic forces led by Ms Suu Kyi. They ignored the explanations extended by Myanmar’s articulate foreign minister U Win Aung with regard to the events of May 30, and even desired that ASEAN be kept informed of the progress made in this process of reconciliation. Some of the ASEAN members were rather strong in their criticism of the military regime. Prime Minister Mohammad Mahathir of Malaysia even called for the expulsion of Myanmar from ASEAN if its military rulers did not heed the ASEAN warning. Myanmar’s neighbour and its largest trading partner, Thailand, took upon itself to propose a detailed road map that Myanmar should follow in restoring democratic rule. This road map, described as non-binding and not made public to avoid embarrassment to Yangon, is reported to have underlined the need for a time frame to the process of reconciliation and revival of constitutional governance. Though China continues to support Myanmar’s military regime against Western sanctions and disapproves of any external interference in its internal affairs, the military rulers can no longer ignore the ASEAN pressure. Myanmar, in the long run, cannot afford to be isolated within ASEAN, which has sustained it all these years both economically (through substantial investments from Singapore, Thailand and Malaysia) and politically, through the support in the face of Western pressures. In response to the ASEAN pressures, the SPDC was reshuffled in the last week of August when some of the junior military-ministers were removed and the regime adopted a civilian nomenclature by designating the top military leader, Gen Than Shwe, as the President and the third in command, and intelligence chief Gen Khin Nyunt as Prime Minister. Within four days of assuming the office of Prime Minister, Gen Khin Nyunt came out on August 30, 2003, with a seven-point road-map for the restoration of democracy and holding of a general election. The basic point is the revival of the National Convention for drafting the constitution, suspended since 1996 due to the boycott of Ms Suu Kyi’s National League For Democracy (NLD). The NLD had walked out of this convention because it was packed with pro-military elements, aimed at providing a legitimate political role for the military in the governance of the country. The new Prime Minister has not fixed any timeframe for the revival of the convention, and by implication, the revival would mean that Ms Suu Kyi’s NLD also makes a compromise by joining it and working for a constitution within the parameters defined by the military junta. It is unlikely that she will make this compromise. The junta will thus be free to blame her for not cooperating in the process of “reconciliation”. Even if the constitutional convention is reconvened, there is no guarantee if a consensus on many divisive constitutional issues, such as the role of the military and the question of federalism, will be arrived at. After the drafting of a constitution, it is supposed to be put to a referendum for approval, which leaves another scope for uncertainty. Elections are to be held only after the final approval of the constitution, and if the past is any guide, there is no guarantee either that the junta will hand over power smoothly if the NLD emerges victorious, as in 1988. General Khin Nyunt’s proposed road map for democracy, therefore, seems to be nothing but a cleverly crafted strategy to defuse international pressures, particularly from ASEAN, and buy time to evolve alternatives to retain power for the military. There has yet been no specific reaction from the ASEAN members to this road map, though ASEAN and the western media do not see much hope in this. It is also not clear if Ms Suu Kyi will be released from “house arrest” — there are conflicting reports of her being on a hunger strike. The question of democracy in Myanmar puts India in a situation of dilemma. For over a decade India has pursued a “pragmatic approach” of cultivating the military regime in pursuance of its wider strategic interest of stabilising the turbulent Northeast and containing the adversarial influences of China and Pakistan in Myanmar. India could sustain this pragmatism and distance itself from the cause of democracy in Myanmar because ASEAN was also doing so. Now it has to balance its position with that of ASEAN on the democracy question without doing anything to alienate the Yangon rulers. The writer is a professor at the School of International Studies, JNU, New Delhi. His mother was widowed at an early age and drew a pension from the defence department. When she died some years ago, Arunjit being handicapped, was entitled to a pension based on some rule the British had wisely framed to help such cases. The pension department of the defence required a certificate from civil surgeon stating his medical condition and his inability to make a living. Now civil surgeons don’t give certificates unless some “authority” asks them to examine the case. With the help of some local contacts and an understanding staff at the Sector 16 hospital, a full medical board was constituted which confirmed Arunjit’s medical condition and opined that he was totally incapable of making a living. However, the pension authorities were not satisfied and now wanted to know his IQ as determined by a psychologist. The Sector 16 hospital had no means to test the IQ, but agreed that the results of tests carried out in the military hospital would be acceptable towards issue of an appropriate certificate. A long letter explaining the special nature of the case and Arunjit’s entitlement for treatment in a military hospital was sent to the commandant. While the psychologist at the military hospital within minutes of testing, concluded that Arunjit’s mental age was that of a four-year-old child, yet he decided to grill him with endless series of tests for a few more hours, which was a painful experience for Arunjit. His IQ was recorded as 19 (30 IQ is the lower limit for anyone to look after himself, leave alone make a living) and based on these tests the psychologist at the Sector 16 hospital gave the necessary certificate. Yet, the pension authorities were not satisfied and required another certificate. This time from the “appointing authority”. Now who could be the appointing authority for Arunjit and to what appointment was he placed; as a mentally challenged person ! Only God could have appointed him in that condition. No clarification was forthcoming from the pension people. Then we suggested that, “appointing authority” may actually be, “appropriate authority,” which the pension people reluctantly accepted. Now in this case the appropriate authority, they said, is the Army Headquarters(AHQ). But why AHQ? Anyway, AHQ declined to give any such certificate. May be they felt Arunjit could make a living, perhaps by taking to begging! While this endless struggle, spread over four years, to get him his due pension was still on, Arunjit was taken seriously ill and had to be rushed to the military hospital, where at first, he was refused admission because the authorities there felt he was a non-entitled case, though they knew that he was entitled to a pension from the defence department. Then there was a letter from the previous army chief stating his entitlement to treatment in a military hospital and yet another letter earlier sent to the commandant at the time of tests for determining his IQ, giving his background and entitlement. All that was of little avail and nothing could move the hospital staff. Some pull, push and a jack got him into the military hospital. But the surgeon went away before the appointed date for his operation and the authorities decided to discharge him. So when his sister went to meet him, she found him slumped in a wheelchair in the verandah, rather than in his bed. He had been discharged in the morning. This ejection from military hospital was followed by desperate rounds of some private hospitals. In his condition, this to and fro shifting was too much for Arunjit and he gave up life gasping for breath. What entitled Arunjit to a pension from the defence department? His father, Diwan Ranjit Rai, was in command of 1 Sikh, the most famous battalion of the Indian Army when he was dispatched, post haste, along with two of his companies, to save, if possible, the Srinagar airfield and the town from the advancing tribal hordes. He accomplished this task with remarkable skill and daring. Alive to the historic nature of his mission, he acted well beyond the call of duty and in the process laid his life. In fact, by saving the airfield he saved the Srinagar valley. He was the first officer of the Indian Army to lay down his life in the defence of J and K and also became the first recipient of Maha Vir Chakra (MVC) in the country. Arunjit was his only son and the rules entitled him to a pension and treatment in a military hospital. His pension never came through and authorities at the military hospital never reconciled to his entitlement. Bureaucracies, civil or military, are equally heartless, pitiless and cussed. THE level of politicisation in the institution that traces its roots back to pre-partition Punjab, the one that was spelt with an ‘a’, is so high as to be all-pervasive. The Senate, the Syndicate faculty members, employees and students, all are “politically” active. As of now, political parties have not made direct inroads in the university, and the politics is largely that of certain distinct pressure groups that assert their influence though various bodies in the institution. Other than politics, a red-tape-dominated administrative machinery and a staus quoist faculty are the main problems. At the same time, there are islands of excellence, such as the Pharmacy Department, where the university is leading. Some new initiatives have also been taken recently. Easily the most important university north of Delhi, with a 550 acre campus, Panjab University is federally administered, with the Vice-President of India as its Chancellor. It now gets grants both from the Union Territory of Chandigarh (60 per cent) and the Government of Punjab (40 per cent), from which it has not been getting its full share. There was a big financial crunch a few years ago, when even the ability to pay salaries was doubted, but now finances have been managed. The university had been able to almost double its budget and is tapping alternative sources, including the corporate sector, which is, however, difficult given the structure of governance. The Senate has 15 members from the “graduate constituency,” that comprises persons who have graduated from the university-a historical baggage that seems anachronistic during the current times when there are lakhs of graduate students. Perhaps it should now be a post-graduate constituency. This time, there are only two university teachers, one of whom is a retired Professor, on the Syndicate. Academics have suffered because of a high degree of “political” activity, no wonder the academic atmosphere suffers. Some long-timers complained of pressure groups scuttling reforms or attempts at modernisation. The Vice-Chancellor, Prof K.N. Pathak, has served the university in the Department of Physics and as DUI earlier. He, therefore, has the advantage of first-hand knowledge of the functioning which has enabled him to remove some bottlenecks. The handing over of the cashier system to the State Bank of India, has had a positive impact. This move faced strong resistance, but had resulted in improved disbursement and collection of funds. Of course, not all bottlenecks have been removed, researchers still rue the computer committee that delays the acquisition of computers that they are entitled to get through various research grants. The Vice-Chancellor’s honesty and his ability to raise funds for the cash-starved institution are often talked about, as is his habit for setting up committees to sort out issues, rather than take decisive action. His supporters, however, contend that this is to ensure democratic functioning. An academic and administrative audit report recently undertaken for the university and its 108 affiliated colleges has given it, overall, high marks. More than 25 per cent of the existing departments are entitled, because of their superior performance, to UGC SAP/DSA/ COSIST programmes. 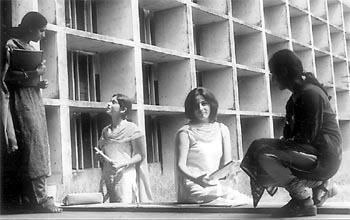 The rotation of departmental heads was originally thought of as a means of decentralising and democratising the functioning of the university. Many teachers feel that actually the departments have become weaker with rotation. A lack of collective spirit is obvious, as is a lack of vision. University departments, with some notable exceptions like Pharmacy, Geology, the University Business School, and Department of Mass Communication, shows a sad degree of status quoism and a “chalta hai” attitude. The administrative side has to deal with a large number of students, but is not streamlined, and there are numerous bottlenecks. The “single window” initiative has failed to take off. Computerisation and work flow planning are necessary to improve the functioning. The Distance Education Department of the university is the biggest, with a faculty of 76. There have been some audio-visual initiatives and the department is well aware of the need for interactive lessons, but awareness has not translated itself into decisive action. A new computer lab, with 10 machines, has been recently opened for students. BEd and MEd courses have been added from the current academic year. Some students, however, complained of late receipt of reading material. Though it serves over 15,000 students, the department’s administrative wing has still not computerised. A start has, however, been made from this year with the BA I and B Com I classes. The University Business School (UBS) was recently ranked among the 25 top institutions in nation. It has an initial absorption rate of around 60 per cent. The first batch of e-commerce students will pass out this year, but this is a time of uncertainty in computer-related fields. Promotion of inbreeding is a critical issue. “There is very little fresh blood, and most of the faculty were at one time students of the same institution. This is not something unique to Panjab University; indeed, most Indian universities are like that. In direct contrast, many good foreign universities take active steps to keep inbreeding in check,” points out a Professor, who says he makes a conscious attempt to steer his research students away from the university. Many teachers trace the status quoism to this root. This also results in more entrenched pressure groups. The re-induction of a number of rather controversial officers on the administrative side is reportedly because of their being politically well-entrenched. The Vice-Chancellor refutes such suggestions and rolls out facts to support his case. “In any case, I have told the faculty that if any Professor wants even Rs 1 lakh for a project, I will sanction it, provided the project stands the scrutiny of peers,” he says, adding that he wants to support research. At the same time, there is no denying the lack of students and faculty in such departments like Hindi, the evening department for English, the once-famous and prestigious department of History of Fine Arts now makes do with just one working teacher…the list can go on and on. There is pressure on various departments to freeze recruitments. Much-needed consolidation of departments has not been done, apparently because of pressure groups that most people in the university assert undue influence. The English Department is reputed to be the biggest in the country. Every year, 120 students are selected from 800-odd applicants. Its PhD and MPhil courses are well known. However, though individually accomplished, with some teachers of international repute, the faculty of the English Department has not distinguished itself as a team. Many of the top journalists in the region are products of the Department of Mass Communication. It has a good placement record, especially in the print media, which is considered its core competence. TV journalism and Internet/rich media content are the new fields that the department will need to concentrate on. Girl students constitute 70 per cent of the students, and the hostel facilities for them are inadequate. Women’s toilets are woefully inadequate. As for the facilities for men, you generally need to follow your nose to find them. Girls studying science particularly complained of the feudal culture and of not being allowed to get out of the hostels after 9 pm. In any case, even if they want to, they cannot enter the research labs at night, something that the boys are allowed to do. Incidentally, even in science departments, there is a big shortage of computers and often the students have to use them in shifts. The university had recently hit headlines because of a controversy regarding the evaluation of answer sheets. Criticising the concept of external evaluation as a throwback to the distrust of the colonial era, a teacher said that those who teach must evaluate. The Vice-Chancellor says he wants transparency and is rightly proud of adhering to the schedule of the results. However, what matter is not only if the results are declared in time, but also how answer books are evaluated. The jury is still out on the efficacy of system. The university library gets high marks from students. It has over 6 lakh books and the staff’s helpful attitude is admired. On the other hand, the not-so-helpful attitude of the administration is lamented by all. The bureaucratic attitude and red-tapism is roundly criticised by the faculty and the students alike. This is perhaps the only university in the region in which employees do not get pension, and this is an issue that is agitating the minds of the employees. The Panjab University Teachers’ Union has also been agitating on the issue and is planning have its members go on a mass casual leave on October 5 in order to press this issue. The kind of non-issues that dominate departmental meetings can be illustrated by a recent example in which the faculty spent two hours discussing what should be done with a 15-year-old television set that had stopped functioning a while ago and had already been replaced. Vandalism by students, particularly those of evening college, has taken its toll. Much of the furniture is broken down and the university’s construction office which is responsible for maintenance is widely criticised. A number of faculty residences are lying vacant, and will need major renovation before they are habitable. The establishment of the University Institute of Engineering and Technology with four new BE courses, including biotechnology engineering, software engineering, micro electronics and telecommunications has been generally welcomed. The UIET has been touted as a major money spinner for the university, but it has been controversial, since students preceded faculty, though a number of appointments have been made recently. The doubling of the Internet bandwidth has, of course, helped students and faculty, though the networking hub was not working in certain departments. Again, it boils down to maintenance, and having the right spirit. This is a university that has it all, except for a collective vision and a willingness to work together. In this, it is not unique by any stretch of imagination, but then, the expectation from the region’s premier university is far higher than other such institutions. And no ill wind will harm you. The mind of the unbeliever wavers and wanders in the futile quest after wealth. In shade nor in sun. All religions of the world describe God pre-eminently as the Friend of the friendless, Help of the helpless, and Protector of the weak.